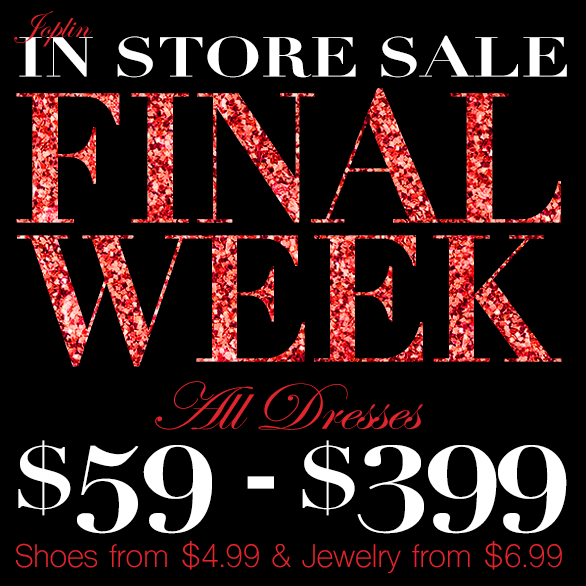 It's our LAST WEEK - 7 more days to save! Everything is on sale in our Joplin store and we can't wait for you to come in and get something beautiful for your next social occasion. Save hundreds on a dress or get a cheap pair of shoes or earrings for a night out. Hundreds of items are still available, but they are going fast, so hurry in! Wedding dresses $99 - 399! accessories • garters • Foot Petals • Spanx • Hollywood Secrets and more!